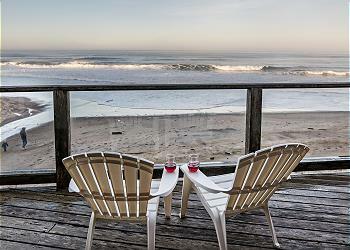 Free Night Offer Feb 21-March 23 Beachfront in Gleneden Beach (quite stretch of beach 1 mile South of Lincoln City). This sweet, shingled cottage puts the ocean front and center, with an elevated, panoramic view from every window of the great room. You'll find it easy to kick back and relax in the plush living room complete with wall-mounted flat screen TV/DVD/Blu-ray, gas fireplace and the ever-present sound of surf. You'll enjoy watching for whales from the dining table and seeing pelicans and other seabirds glide past as you do the dishes in the fully equipped kitchen. Even the laundry room has a fantastic ocean view! The two queen bedrooms are on the quieter eastern side of the home. You'll love the sunny, private courtyard entryway, and the western deck is transparent but wind-screened, with dining furniture and Adirondack chairs. The access to beautiful Gleneden Beach is right next to the driveway, so you can wave to your guests from the porch as they run down to the water. Gleneden Beach puts you between Lincoln City and Depoe Bay and Newport for some wonderful day trips, but you may just enjoy walking along the ocean's edge and exploring the town of Gleneden Beach. There's golf and a world-class spa at nearby Salishan, a coffee-house/wine bar called the Red Roof and delicious dining at the Side Door Cafe. Come fill your eyes and spirit with the beauty of Gleneden Beach with a stay at Kristy's Kottage! Memorial Day & Labor Day Weekends 3 nt. Minimum. Summer 2019 4 nt mimimum (unless filling a gap). Please avoid a Single Night gap May - Sept. & Spring Break. "Wonderful! Views are unbeatable. Place was clean and beautifully furnished and decorated. Alot of nice touches. Deck not off main floor. Would stay there again. " "Quiet, clean and good location everything I was looking for, I would recommend "
"This cottage is at a perfect location. Nice modern decorations. Note the deck is down a flight of stairs off the deck. Its amazing views. " "Very cute little place. Very private beach with not many people. The view is amazing. " "Started auspiciously enough as the previous renters decided not to leave on time. They stated they were confused about their dates, but the property managers were proactive, called us before we even got there, and had them leave. The property is cozy, perfect for a couple or a small family. View is gorgeous and getting to and from the property is easy. The week we were there there were no more than 20 people on the beach in front of the property, almost like having a private beach. Some previous reviewers complained about the steep access to the beach, but it was pretty easy. If you are over 80 or have any sorts of major mobility issues, getting to the beach could be an issue, but for most able bodied adults and even children is it fine. There is no access directly from the house, you must take the path next to the house. Wifi was strong (even have 2 routers), appliances worked, water pressure was fine. The deck pictured is not on the living level, you have to take outside stairs to access. It is next to a storage room, I wish they would convert that to a game room, maybe a sleeper sofa. No issues with the house, it was a great time. We would come back, but we have a practice of trying new locations every year. While staying at the property I recommend Local Ocean Seafood restaurant in Newport. Also the lighthouse tour there is worth the trip (Newport is 30 minutes south). Also make sure to visit Pacific City (30 minutes north) to the north and the Tillamook Creamery (1 hour north). Portland traffic heading back to the airport can be tricky at any time of the day or week, so add an hour just to be safe. No Uber or Lyft, a good rental car is a must. Thank you Kris, Bruce, Karen and Linda!!!" "Our stay at Kristy's Kottage was perfect! Great views! The house has everything you need for a quaint beach getaway. We sat inside, out on the deck, and down on the beach and watched whales, seals, birds, and kids playing on the beach! " "Kristy’s Cottage was a great place to stay - clean, well appointed, and good proximity to the beach." "Our stay at Kristy's Kottage was very relaxing. Loved being able to hear the ocean from the deck. The location was perfect and the home was wonderful"
"Kristy's Kottage was Almost Perfect. The view was Spectacular! sat out on the lower deck in the Sunshine with a book to read and a glass of wine. needs Binoculars and a small hot tub! Loved it! "We were looking for a little home away from home beach rental and found Kristys Kottage . Its location is spectacular! The beach is just a few steps away . The view from the kitchen/dining area is breath taken. We really enjoyed our stay wasnt sure what to expect because of the downstairs studio. On the pg it mentioned the owner might be there but there was no one there it looked more like a storage area which in a way it was nice cause we had the home to ourselves. It would of been nice if the home had a grill to bbq outside. Other than that I highly recommend this home." "We LOVED this home! Clean, comfortable, and excellent location!" "Our friends and us enjoyed our 4 night stay. The weather was perfect, sunny with temperatures in the mid to upper 60's. We enjoyed watching and hearing the waves crash into the shore from the big windows in the living room. Took several walks on the beach and collected shells for the grand kids. The home is warm, cozy,very clean and well maintained. The perfect size for 4. We were disappointed to find the home didn't have a BBQ. We would have liked to have a BBQ dinner out on the deck during the nice evenings. We will definitely come back. " "The house we had was amazing, so cozy and a great view"